The HVR200M-A2 Henry Micro is the Henry of choice for those who suffer from dust related allergies, which is true of 20-30% of the population. Added to the full Henry specification comes Numatic's exclusive Microtex filtration system which has been approved to the highest standard by the British Allergy Foundation. Like the standard Henry, the Henry Micro is a dry only vacuum cleaner with a powerful 580W two stage motor. It has a 10m cable with an easy to use rewind system. This is the latest version of then Henry I bought for my son and daughter-in-law as she suffers from allergies to certain animal hairs and they have a lot of small animals in their home as his job is to visit schools and give talks and demonstrations regarding animals and ecosystems. Here's an interesting fact - owners of any of the regular Henry vacuum cleaner models can upgrade to the Micro's allergy standards by replacing the standard Tritex filter with a Microtex filter and ensuring they use the Hepaflow filter bags. The Henry Micro is normally supplied with what Numatic call "Accessory Kit AS1"
The AS1 kit metal components are made of stainless steel. When buying your Henry Micro you want to make sure you find a good supplier. Online it can be difficult to know which suppliers you can trust but I have found, to my surprise, that Amazon sell other things beside as books. 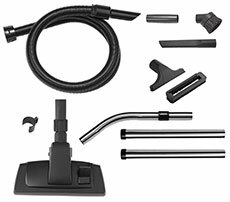 What's more they have some of the best vacuum cleaner prices and provide the security of buying from a well known and trusted company. So I have included a Henry Micro product link to Amazon on this site which displays their current price. And remember, with Amazon delivery is included in the price shown. 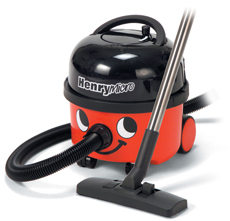 Simply click on the link to purchase your very own Henry Micro Vacuum Cleaner.